Just to reassure fellow moth enthusiasts that I am trying, here is a picture of the moth trap this morning. Sadly, the power of its light availed nothing against temperatures well below zero and the patchwork carpeting of snow. The eggboxes were empty come dawn. There are no Winter Moths abroad in March, with their fascinating equivalent of blood which is more or less the same as car antifreeze - but even so, they take up to half-an-hour to warm up enough to fly on icy nights. It's all got me thinking about Darwinism and the way that species adapt, although I consider myself more of a morsel of Lamarckian proof. If I precis correctly, Darwin rightly described evolution as governed by the effects of neutral changes in surroundings whereas Lamarck wrongly suggested that species could play a part themselves in adapting and surviving. As a result, the trap has been stashed away for ages and looks like staying that way. 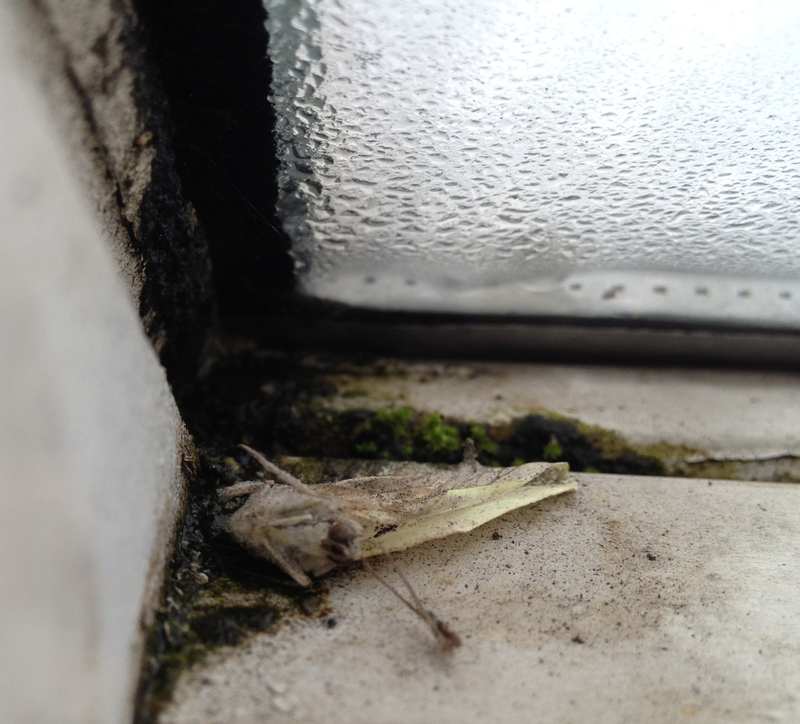 But entomologists never rest, and I came across this sad scene while cleaning the greenhouse. It puts you in mind of Oscar Wilde's unhappy last years and the phrase from Alexander Pope which I have used as my header. It's a Green-veined White, or was. RIP. At least it posthumously carries the promise of Spring and Summer which, for all our dismal snow, sleet and rain this March, are not so very far away. Just a mini-post to say (a) that I am trying to provide you with moths but the total in the trap last night (a bit murky and chilly after the warmest day of the year so far - which isn't saying much) was...nil. And (b) I am belatedly reading Vernon God Little by D.B.C.Pierre and enjoying it, unexpectedly. I'm only about 50 pages in but he has referred to moths twice. Among many other things. And look! 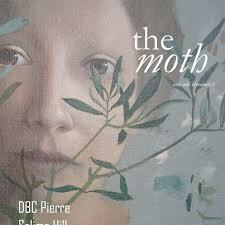 He contributes to a very excellent Irish literary magazine, called The Moth! Today's customary greeting as the first of the month is 'White rabbits!' 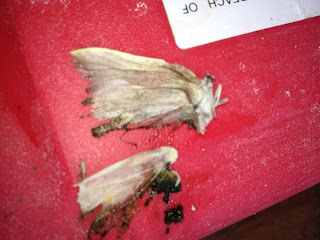 But here on M's Moths, it is 'Black moth!' because my faith in lighting the trap for the first time since January was rewarded by this: a melanistic Peppered Moth. Isn't it fine, including what my eyes consider a slightly greenish sheen? These used to be two-a-penny in northern England when the factories belched out smoke but they have declined dramatically as the air has grown cleaner and the countryside less polluted, or indeed melanistic. Although I am no expert on Darwinian theory, I once had the pleasure of meeting the late Sir Cyril Clarke, the doctor and entomologist who correlated the rise in non-melanistic Peppereds with the increase in UK centenarians. Buckingham Palace helped him to count him the birthday telegrams from the Queen. Also in the trap, perched on the edge of the bowl, was this little chap above, whom I'll identify later, (Update: I think it's a Chestnut) and this littler one below,reading the Scottish section of the Egg Code (did you know we had one? ), whom I'll sort out later still. Update: I'm guessing it's Tortricodes alternella, catchy name eh? 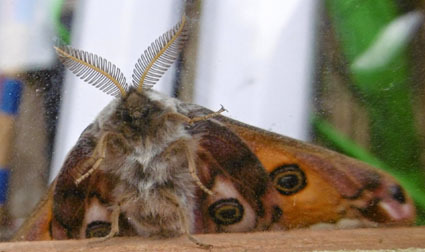 And finally, what is this magnificently spooky non-moth? You can see where people such as George Lucas get their ideas for Star Wars creatures et al.